In his book, Capital in the 21st Century, Thomas Piketty portrays the rich as heirs with privileged access to high rates of return, stating “it is almost inevitable that inherited wealth will dominate wealth amassed from a lifetime’s labor.” He points to the Forbes wealth rankings for support. In fact, the Forbes 400—an annual ranking of the richest Americans—indicates wealth is much more fleeting than Piketty suggests and is characterized more by entrepreneurship than by inheritance. Of the Forbes 400 from 1987, 327 people have dropped off the list. Of the remaining 73 people, those with the highest annual rates of return are generally self-made entrepreneurs and investors—not heirs—with an average annual real rate of return of 5.6 percent over the last 26 years. The rate of return for the Forbes 400 as a whole, 2.4 percent, is roughly equal to Piketty’s estimated returns for the entire population. Wealth today is largely generated by entrepreneurial skill, with the number of entrepreneurs on the Forbes 400 list rising from 40 percent in 1982 to 69 percent in 2011. The role of inheritance has diminished over the last generation; the share of the Forbes 400 that grew up wealthy has fallen from 60 percent in 1982 to 32 percent today. As with individuals, the wealth of corporations has been highly dynamic over the last 30 years; turnover in the Dow Jones Industrial Average has increased in recent decades, with only one corporation (General Electric) remaining on the Dow Jones for more than 100 years. This year’s most popular economics book, Thomas Piketty’s Capital in the Twenty-first Century, has a message made for a popular audience. It spells out people’s worst fears about capitalism: that it causes economic inequality that if left to run its course could lead to a tiny ruling elite controlling virtually all wealth and power. This is compelling, bad news, but do we have any evidence that it is real? Have two or three hundred years of capitalism resulted in a permanent plutocracy? Piketty’s answer is that the two World Wars and Great Depression destroyed so much capital that it set the owners of capital back a few decades; however, wealth concentration is once again reaching levels that existed in the Belle Époque prior to World War I. Piketty believes that the best way to stop this process is through a progressive income tax of 80 percent and an internationally-enforced progressive wealth tax of 10 percent. I have serious reservations about Piketty’s theorizing as a guide to understanding the evolution of American inequality. And, as even Piketty himself recognizes, his policy recommendations are unworldly—which could stand in the way of more feasible steps that could make a material difference for the middle class. Summers and most economists who have commented on the book believe Piketty is right that inequality, both of income and wealth, has increased over the last generation, at least to some degree. Top earners, it appears, are reaching new heights in terms of both income and accumulated wealth both in absolute and in relative terms. However, this does not necessarily mean that the rich stay rich. It could be that obtaining wealth is like juggling: the balls rise impressively but soon fall. For it to be otherwise, it would need to be the case that there is some failure of competition at the top, that the rich are shielded from economic downturns, that they have privileged access to the best investments, or that they (and their children) are simply smarter than the rest of us. When the rate of return on capital significantly exceeds the growth rate of the economy (as it did through much of history until the nineteenth century and as is likely to be the case again in the twenty-first century), then it logically follows that inherited wealth grows faster than output and income. People with inherited wealth need save only a portion of their income from capital to see that capital grow more quickly than the economy as a whole. Under such conditions, it is almost inevitable that inherited wealth will dominate wealth amassed from a lifetime’s labor by a wide margin, and the concentration of capital will attain extremely high levels – levels potentially incompatible with the meritocratic values and principles of social justice fundamental to modern democratic societies. What is more, this basic force for divergence can be reinforced by other mechanisms. For instance, the savings rate may increase sharply with wealth. Or, even more important, the average effective rate of return on capital may be higher when the individual’s initial capital endowment is higher. Piketty portrays the rich as heirs with privileged access to high rates of return—an image he fleshes out mainly through references to the 19th century fiction of Jane Austen (16 references) and Honoré de Balzac (23 references), both of whom wrote of Europe’s landed aristocracies. In reality, the rich in America today are generally people like Bill Gates (5 references) or Larry Ellison (no references), entrepreneurs who did not come from extreme wealth. There is simply no evidence for Piketty’s claim that inherited wealth is becoming “dominant.” Recent research by other economists indicates just the opposite: wealth today is largely generated by entrepreneurial skill rather than inheritance, and the role of inheritance has diminished over the last generation. Further, Piketty claims that the rich enjoy a higher rate of return than the rest of society, pointing to the Forbes billionaire rankings. In fact, the Forbes rankings indicate that the rich have an unspectacular rate of return of less than 2.4 percent per year on average, probably closer to as low as 0.2 percent. This explains why there is so much turnover on the Forbes 400. Most people on today’s Forbes 400 list were not there a generation ago, nor were their forebears. There is also no evidence of increasing capital accumulation and concentration among America’s corporations, which are, after all, the ultimate capital accumulation machines. For instance, over the period that concerns Piketty the most, the rise and fall and rise again of capital over the 20th century, every Dow Jones component but one (General Electric) has come and gone. The mid-century period that Piketty sees as most ideal, when top tax rates were above 90 percent, actually exhibits the lowest turnover rate among big corporations, indicating less competition and dynamism. Ultimately, Piketty succeeds in demonstrating increasing inequality in terms of the rich reaching new levels of income and wealth, but he fails to show that the rich are the same people or group of people from one year to the next. Indeed, he has misconstrued the limited data available to fit his story and in the process provided an inapt argument for higher levels of income and wealth taxation. While Piketty analyzes both income and wealth inequality in his book, the “potentially terrifying” aspects of his story have to do with wealth accumulation and concentration among a privileged elite. In both his book and his response to critics, Piketty makes plain the severe data limitations he encountered in trying to estimate the distribution of wealth in the U.S. and other countries. For the most part, he relies on estate tax records, which for the U.S. begin in 1916 and only cover a small part of the population. France is the only country with estate tax records covering a large portion of the population throughout the 20th century and much of the 19th century. For the U.S., Piketty also relies on the Federal Reserve’s Survey of Consumer Finances, which only begins in the 1980s and insufficiently samples high wealth individuals. As such, Piketty turns to other sources to measure wealth in America, particularly the annual wealth rankings published by Forbes. Piketty uses the Forbes ranking to calculate the annual real rates of return for the wealthiest percentiles from 1987 to 2013. He finds that the top 0.000001 percent (about 45 people in 2013) and the top 0.00001 percent (about 225 people in 2013) have annual real rates of return of 6.8 and 6.4, respectively. In contrast, using worldwide wealth data, Piketty estimates that the average annual real rate of return on wealth per capita is 2.1 percent from 1987 to 2013. These calculations are shown in Piketty’s Table 12.1 (page 435), reproduced below. But it is important to realize that the inequality r > g, amplified by inequality in the returns on capital as a function of initial portfolio size, can potentially give rise to a global dynamic of accumulation and distribution of wealth characterized by explosive trajectories and uncontrolled inegalitarian spirals. As we will see, only a progressive tax on capital can effectively impede such a dynamic. A more thorough analysis of the Forbes rankings contradicts Piketty’s claims about wealth accumulation. Piketty refers to the Forbes ranking of the world’s billionaires, but it is the Forbes 400 ranking of the wealthiest Americans that is most pertinent to wealth inequality in America. The same high rate of turnover is evident in the period that Piketty analyzes, from 1987 to 2013. Of those on the 1987 Forbes 400 list, only 73 remain there in 2013. Typically, dozens fall off the list every year. Last year, 6 members died and 28 fell off because their fortunes underperformed, including energy investor T. Boone Pickens, 5-hour Energy drink creator Manoj Bhargava, Washington Redskins owner Dan Snyder, Campbell’s soup heiress Charlotte Colket Weber, AOL founder Steve Case, and three heirs to the Hearst fortune. Second, Summers is also correct that the reason why there is so much turnover is that the typical Forbes 400 member gets an unspectacular rate of return over the long term. In fact, most earn well below 4 percent a year on average. Looking at the period 1987 to 2013, and taking just the winners (i.e., those 73 people who stayed on the Forbes 400 the entire 26 years), the average annual real rate of return among them is 5.6 percent. However, this ignores the 327 people that dropped off the list sometime between 1987 and 2013. If we assume, quite optimistically, that those who dropped off the list just barely missed the 2013 cut off of $1.3 billion, the average person on the 1987 Forbes 400 list got an annual real rate of return over the last 26 years of just 2.4 percent. More plausibly, many who dropped off the list dropped way off the list. Assuming their average wealth today is half the minimum cut off ($650 million), the average member of the Forbes 400 got an annual real rate of return of just 0.2 percent between 1987 and 2013. That means the average person worldwide, according to Piketty’s estimates, gets about ten times the annual real rate of return as the average person on the Forbes 400 list. Of course, getting to the Forbes 400 requires an exceptionally high rate of return, but once there, it appears, most fortunes grow slowly or not at all. Third, contra Piketty, there is no indication that inheritance is “dominant” in the Forbes 400. In fact, the role of inheritance is small and appears to be diminishing with time. For instance, a quick glance at today’s Forbes 400 indicates it is dominated at the top (the top 20, for example) by entrepreneurs who founded or lead successful companies: Bill Gates (#1), Larry Ellison (#3), Charles and David Koch (tied at #4), Michael Bloomberg (#10), Jeff Bezos (#12), Larry Page (#13), Sergey Brin (#14), and Mark Zuckerberg (#20). Another group are successful investors: Warren Buffett (#2), Sheldon Adelson (#11), Carl Icahn (#18), and George Soros (#19). A minority (7 of the top 20) are heirs to large entrepreneurial fortunes: the children of Sam Walton (#6 to #9) and the grandchildren of Frank Mars (tied at #15). The [people in the] Forbes 400 in recent years did not grow up as advantaged as in decades past. Those in the Forbes 400 today are less likely to have inherited their wealth or to have grown up wealthy. They are more likely to have started businesses having grown up with some wealth, what we consider to be the equivalent of upper middle class. The Forbes 400 of today also are those who were able to access education while young and apply their skills to the most scalable industries: technology, finance, and mass retail. [T]he share of Forbes 400 individuals who are the first generation in their family to run their businesses has risen dramatically from 40 percent in 1982 to 69 percent in 2011. [T]he percent that grew up wealthy fell from 60 percent to 32 percent, while the percent that grew up with some money in the family rose a similar amount. Other economists have come to similar conclusions using other techniques and other data sets, for example estate tax returns. Furthermore, looking again at the annual rates of return of those on the Forbes 400 from 1987 to 2013, those with the highest returns are generally self-made. For example, taking the ten people on the Forbes 400 list that have seen double-digit annual real rates of return over the last 26 years, six are entrepreneurs, four are investors, and zero are heirs. Larry Ellison got an 18 percent annual real rate of return by co-founding and leading the software company Oracle. George Soros, the world’s most successful currency speculator, got a 14 percent annual real rate of return. Bill Gates got a 14 percent return for co-founding and leading Microsoft, while co-founder Paul Allen got a 10 percent return. Ronald Perelman got a 13 percent annual real rate of return as a master of leveraged buyouts. Phil Knight got a 13 percent annual real rate of return by co-founding and leading Nike. David and Charles Koch each got returns of 12 percent per year for their holdings and management of Koch Industries. Carl Icahn got a 12 percent annual real rate of return as an “activist” investor. Finally, Warren Buffett, the legendary investor, got an 11 percent annual real rate of return. It is equally instructive to look at the biggest losers on the Forbes 400 over the last 26 years, which includes those who had low rates of return but remained on the list as well as those who fell off the list entirely. Ross Perot, founder of Electronic Data Systems and two-time candidate for president, was America’s third-richest person in 1987, according to Forbes. He is now the 134th richest person, with a -2 percent annual real return over the last 26 years. His son, Ross Perot, Jr., is currently ranked the 314th richest person, and combining father’s and son’s wealth still results in a negative annual real rate of return (-0.4 percent). Henry Ford’s last surviving grandson, William Ford, Sr., died this year at 88. He was the richest Ford heir, ranking 371st on the 2013 Forbes 400 list. In 1987, he ranked 53rd, but his net worth dropped on average 1 percent per year for 26 years. The four Bass brothers inherited a fortune from their oil tycoon uncle Sid Richardson four decades ago. Since 1987, two out of the four have shrunk their fortunes in real terms (annual real rates of return of -0.9 percent and -0.3 percent) while the other two have only modestly increased theirs (annual real rates of return of 0.5 percent and 1.3 percent). Adolph Taubman and Henry Hillman, who ranked 17th and 18th on the 1987 Forbes 400, dropped in the rankings after seeing negative annual real rates of return for 26 years (-0.5 percent and -0.9 percent). The sole remaining Rockefeller on the list, 99 year old David Rockefeller, Sr., has grown his wealth at a rate of 1.2 percent above inflation for the last 26 years. The other two Rockefellers that were on the list in 1987 have since fallen off. Others who have dropped off the list include: all sixteen heirs to the du Pont fortune, all five heirs to the Hearst fortune, all three Dursts, all three Searles, three out of four McCaws, both Marshal Fields heirs, two Mellons, one out of three Marriotts, one out of four Koch brothers, and the only Forbes (Malcolm, who died in 1990). In other words, the biggest winners on the Forbes 400 are typically entrepreneurs, while the biggest losers are often heirs. This is completely at odds with Piketty’s claims. Piketty also looks at university endowments to support his claim that returns are higher for larger fortunes, and he finds some evidence for that. According to Piketty, the endowments at Harvard, Yale, and Princeton averaged an annual real rate of return of 10.2 percent between 1980 and 2010, compared to 6.2 percent for small endowments of less than $100 million. Piketty attributes the Ivy League advantage to “more sophisticated investment strateg[ies].” While the differences are puzzling, these high returns are not generally representative of investment returns, since endowments have the peculiar benefit of being tax free. Corporations, being taxable, massive accumulators of capital, provide a better test of Piketty’s theory. Based on market capitalization, for instance, Microsoft is about five times richer than Bill Gates. If Piketty’s theory is correct, the bigger the corporation the bigger the return, which eventually should lead to one giant corporation. We should at least see some degree of concentration among a few big corporations. Figure 1 shows the history of the Dow Jones Industrial Average, since it began in 1885, in terms of new companies on the index. It illustrates that turnover on the Dow Jones was relatively high in the early part of the 20th century. 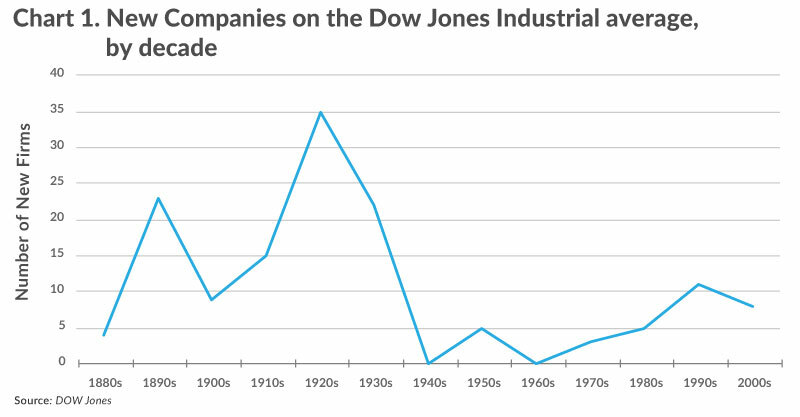 During the 1920s, for example, 35 new companies joined the Dow, meaning 35 companies dropped off. Turnover fell in the post-war decades. For example, there were no new companies in the 1940s, only 5 in the 1950s, and no new companies in the 1960s. Turnover once again increased in recent decades. In the 1990s, 11 companies joined the Dow, and in the 2000s, 8 companies did. This U-shaped pattern over the course of the 20th century is much like the U-shaped pattern of inequality that Piketty has identified. When inequality was high at the beginning of the 20th century, so was turnover on the Dow Jones. When inequality was low at mid-century, so was turnover on the Dow Jones. Both are now high again. Economic dynamism, it seems, at least as measured by turnover on the Dow, is correlated with inequality. It is also correlated with high economic growth, for example during the 1920s and 1990s. At any rate, the history of American corporations provides no support for Piketty’s theory of capital accumulation. Instead of a slow, decades-long accumulation and concentration of wealth in recent decades, there has been wave after wave of new entrants and new industries. It is a picture of competition and creative destruction, as Joseph Schumpeter called it, not wealth concentration. The entrepreneur inevitably tends to become a rentier, more and more dominant over those who own nothing but their labor. Once constituted, capital reproduces itself faster than output increases. The past devours the future. The consequences for the long-term dynamics of the wealth distribution are potentially terrifying, especially when one adds that the return on capital varies directly with the size of the initial stake and that the divergence in the wealth distribution is occurring on a global scale. Piketty goes on to describe the importance of “economic facts” and “historical experience” in economic theorizing, yet his own theory lacks factual support and is contradicted by the historical data he cites. Namely, the Forbes wealth rankings indicate that the richest Americans are typically self-made entrepreneurs, such as Bill Gates, and that entrepreneurial fortunes are seldom maintained beyond the first generation. Further, entrepreneurs make up a greater share of the Forbes 400 than they did a generation ago. Bill Gates, who Piketty cites as evidence that the wealthy grow their wealth at higher rates than the rest of us, is in fact extremely exceptional. The average annual real rate of return of those on the Forbes 400 is less than 2.4 percent, probably much less. Piketty deserves credit for demonstrating that top incomes and wealth are higher than they were a generation ago, but his explanations and interpretations of that trend are without basis. Most economists attribute higher incomes to the relatively benign process of globalization making innovation and top talent more valuable, e.g., the worldwide adoption of Microsoft products over the last generation. Piketty, instead, prefers a darker theory of “supermanagers,” who then enjoy high rates of return on their wealth, which is then bequeathed to heirs who also enjoy high rates of return. In these beliefs, Piketty is virtually alone in the economics profession and at odds with historical facts. Piketty’s policy proposals for extreme taxes on income and wealth are equally out of touch with economics and history. He glowingly recounts the huge tax increases of the 1930s, which raised the top income tax rate from 25 percent in 1931 to 79 percent in 1936, but draws no connection to the Great Depression that ensued. He claims such taxes do not impact productivity or economic growth, against all evidence to the contrary. The sad irony of Piketty’s tax proposals is that they would exacerbate the very problems he has identified. His proposed policies are aimed at the wealthy, who are the ones most able to avoid these taxes. Ultimately, the taxes are largely passed on to workers in the form of layoffs and lower wages and to consumers in the form of lower quality products at higher prices. Lawrence Summers, The Inequality Puzzle, Democracy (Summer 2014), http://www.democracyjournal.org/33/the-inequality-puzzle.php?page=all. Regarding income inequality, see, e.g., Correspondence: The One Percent: Letters from Robert Solow, N. Gregory Mankiw, Richard V. Burkhauser, and Jeff Larrimor, 28 Journal of Economic Perspectives, 243-248 (2014), http://www.aeaweb.org/articles.php?doi=10.1257/jep.28.1.243. Regarding wealth inequality, see, e.g., Fabian Pfeffer, Sheldon Danziger, & Robert Schoeni, Wealth Levels, Wealth Inequality, and the Great Recession (June 2014), http://web.stanford.edu/group/scspi/_media/working_papers/pfeffer-danziger-schoeni_wealth-levels.pdf. Thomas Piketty, Capital in the Twenty-First Century at 26 (Arthur Goldhammer trans., Harvard University Press 2014). Thomas Piketty, Technical appendix of the book, Capital in the Twenty-first Century, Appendix to chapter 10: Inequality of Capital Ownership, Addendum: Response to FT (May 28, 2014), http://piketty.pse.ens.fr/files/capital21c/en/Piketty2014TechnicalAppendixResponsetoFT.pdf. See Alan Reynolds, Why Piketty’s Wealth Data are Worthless, Wall Street Journal, July 9, 2014, http://online.wsj.com/articles/alan-reynolds-why-pikettys-wealth-data-are-worthless-1404945590?tesla=y&mod=djemMER_h&mg=reno64-wsj. Piketty, supra note 3, at 432. Piketty also calculates rates of return for the period 1990 to 2010, finding that the top fortunes grew at a slower pace of 4 percent a year because stocks and real estate peaked in 1990 and were relatively low in 2010. He states in his book, “Nevertheless, no matter what years we choose, the structural rate of growth of the largest fortunes seems always to be greater than the average growth of the average fortune (roughly at least twice as great).” Id. at 435. Id. at 439. Later, Piketty goes further: “Entrepreneurs thus tend to turn into rentiers, not only with the passing of generations but even within a single lifetime, especially as life expectancy increases: a person who has had good ideas at the age of forty will not necessarily still be having them at ninety, nor are his children sure to have any. Yet the wealth remains, in some cases multiplied more than tenfold in twenty years, as in the case of Bill Gates or Liliane Bettencourt. This is the main justification for a progressive annual tax on the largest fortunes worldwide.” Id. at 443. See Summers, supra note 1. Ryan Mac, Falling Fortunes: The Ones That Dropped Off The Forbes 400, Forbes, Sept. 16, 2013, http://www.forbes.com/sites/ryanmac/2013/09/16/falling-fortunes-the-ones-that-dropped-off-the-forbes-400/. Some of the current Forbes 400 members are descendants of past members. Accounting for their combined wealth (to the degree possible) does not have much impact on these numbers. The 0.2 percent annual real rate of return from 1987 to 2013 increases to 0.7 percent. Charles and David Koch inherited their father’s company and grew it into the second-largest privately-held company in the U.S. The other Koch siblings, who inherited equal shares but did not manage the company, did not do nearly as well. Steven Kaplan & Joshua Rauh, Family, Education, and Source of Wealth Among the Richest Americans, 1982-2012, 103 American Economic Review 158, 159-160 (2013), http://www.aeaweb.org/articles.php?doi=10.1257/aer.103.3.158. See also Bill Snyder, Joshua Rauh: What the Forbes 400 List Says about American Wealth, Apr. 22, 2013, http://www.gsb.stanford.edu/news/research/joshua-rauh-what-forbes-400-list-says-about-american-wealth. See, e.g., Lena Edlund & Wojciech Kopczuk, Women, Wealth, and Mobility, 99 American Economic Review 146-178 (2009), http://www.aeaweb.org/articles.php?doi=10.1257/aer.99.1.146. There is, incidentally, a Gerald Ford who is ranked #296 on the 2013 Forbes list, but he is apparently unrelated (and unrelated to the 38th president). Forbes magazine periodically documents some of the more spectacular flameouts, such as the collapse of the Stroh family’s beer brewing empire. See Kerry Dolan, How to Blow $9 Billion: The Fallen Stroh Family, Forbes, July 8, 2014, http://www.forbes.com/sites/kerryadolan/2014/07/08/how-the-stroh-family-lost-the-largest-private-beer-fortune-in-the-u-s/. Piketty, supra note 3, at 448. Dane Stangler & Sam Arbesman, What Does Fortune 500 Turnover Mean? (June 2012), http://www.kauffman.org/~/media/kauffman_org/research%20reports%20and%20covers/2012/06/fortune_500_turnover.pdf. See, e.g., Steven N. Kaplan & Joshua Rauh, It's the Market: The Broad-Based Rise in the Return to Top Talent, 27 Journal of Economic Perspectives 35-56 (2013), http://www.aeaweb.org/articles.php?doi=10.1257/jep.27.3.35. Piketty, supra note 3, at 507. Piketty, supra note 3, at 513. William McBride, What is the Evidence on Taxes and Growth?, Tax Foundation Special Report No. 207 (Dec. 18, 2012), https://taxfoundation.org/article/what-evidence-taxes-and-growth.